The great Rod Serling passed away forty-two years ago today. In his honor, I'm re-posting this essay that first appeared here back in 2009. Enjoy! Our psyches are so tender, so innocently open, when we’re children that stories enchant us in primal ways they rarely can again. As a kid, I was a story addict—devouring everything from comic books (didn’t matter if it was Richie Rich, Archie, Superman or Spider-Man. I adored them all) to the legends of King Arthur (I was fixated on a knight named Sir Tristram, who, I decided, was so much cooler than that overrated bum, Sir Lancelot); John R. Tunis baseball novels (interesting, considering I was in no way a sports enthusiast) to history (I was obsessed with Remember the Alamo! by Robert Penn Warren. What boy in the 60’s, raised on TV Westerns, could resist Davy Crockett and Jim Bowie fighting, and dying, side by side?). And then there was the singular genius of Dr. Seuss: I have a clear memory of clutching my parents hands as we walked to Brooklyn’s Avenue J Library; then sitting, transfixed, in the children’s section, discovering Theodor Geisel’s absurd, illuminating universe for the first time. There was The Wizard of Oz, played once a year, every year. (Can a child today, able to watch the film ad infinitum on DVD, possibly imagine the thrill of pulling a chair up close to the TV and waiting, with almost desperate anticipation, for that MGM lion to roar?) A Christmas Carol, which, every Christmas Eve in New York, would be played at least three times (on The Late Show, The Late, Late Show, and The Late, Late, Late Show. Two runs for the absolutely perfect 1951 version with Alistair Sim, with the 1938 Reginald Owen interpretation sandwiched in between. My mother would eventually shuffle off to sleep, but my father and sister always stayed up with me to watch them all). I adore Disney’s Peter Pan (the scene of Peter and the children flying over London is one of the most thrilling in screen history), but it was the Mary Martin version—which appeared on television with less frequency than Oz and so, in some ways, was even more of a special event—that first captured me. Especially the ending: The eternally-young Peter returns to London, not realizing that decades have passed, and is horrified to find Wendy ”ever so much more than twenty.” I was horrified, too—and deeply moved, in ways my young mind couldn’t really fathom, by the strange, sad tricks of Time. Then of course there was the King of the Modern Imagination—a man who remains one of my heroes—Walt Disney: feeding me his dreams through the movie houses, certainly (the first movie I remember seeing was a re-release of Disney’s Cinderella, when I was two or three: sitting on my mother’s lap, watching those birds and mice caper across a mind-bogglingly huge screen), but far more intimately through weekly doses of Walt Disney Presents—which later became The Wonderful World of Color (made no difference to me, since we had a black and white television). The Disney story that impacted me more than any other was Pinocchio. I’m pretty sure I saw the movie—the Citizen Kane of animated films—when I was a kid, but what I remember most was a record I owned (yes, a record. Those large, disc-shaped objects that existed before CDs) which featured Jiminy Cricket himself narrating Pinoke’s story, with music and dialogue from the film. I would listen to that recording again and again and again; lost, in terror and amazement, in the belly of the great whale, Monstro. I have a clear and powerful memory of the first Zone episode I ever saw (I was five years old, staying up late at my Aunt’s house on a Friday night): it was called “Time Enough At Last” and if you’re a TZ aficionado you probably know that it’s the episode featuring Burgess Meredith as a bespectacled bookworm who inadvertently survives a nuclear attack and becomes the last man on Earth (or at least in New York). Meredith’s character, Mr. Henry Bemis, is miserable, lonely, despairing. On the verge of suicide he stumbles through the ruins, looks up—and sees a library: a massive, glorious library that wouldn’t look out of place in Emerald City. In the next scene, Bemis has got books, miles of books, spread out across the library steps. He’s happier than he’s ever been. “Time enough at last,” he says, ready to begin the feast. And then his glasses slip from his sweaty face, fall—and shatter. An absolutely heartbreaking ending (so much so that my daughter, who, thanks to her cultured father, has received an in-depth TZ education, refuses to watch it. Oh, she knows what the ending is, she made me tell her. But just hearing about it made her cry). Despite the tragic ending, despite the haunting—and, at the time of broadcast, frighteningly relevant—images of post-nuclear devastation (the episode never addresses the fact that Bemis will undoubtedly die of radiation poisoning; or perhaps the broken glasses themselves are the metaphor), the image that mesmerized me was the library. Equally significant was Mr. Bemis’s extraordinary solitude. I’ve always been someone who enjoyed the universes inside his own head as much as—sometimes more than—the alleged Real World, so, even at that young age, the idea of one man absolutely alone with all the books he could ever want was tantalizing. Magical. In a strange way I grew up to become a kind of Mr. Bemis, spending decades alone in a room with stories as my only companions. Okay, so I’m writing them, and Bemis was reading them; but, in both cases, it’s about immersing your consciousness in alternate worlds; in preferring those worlds to the bogus reality being fed to us daily by the maya-weavers at CNN. And I have to wonder: Did my impressionable young mind respond so powerfully to that episode because it was in my nature to? Or did “Time Enough At Last” somehow dictate what that nature would be? Who I would become as I grew older? And again I wonder: Did the Zone somehow prepare me for the spiritual search that gripped my soul at a young age, perhaps even inspire it in some way? Or did I respond to those stories because, in my heart, I understood that The Twilight Zone reflected the truth of our lives far better than stories that claimed to be, excuse the expression, “realistic”? I tend to think the latter is true: When our souls are set aflame by an idea, a philosophy, a story, it’s because we’re responding to eternal truths that we already know and believe—even if they might seem (to our conscious minds) blazingly, brilliantly, new. Our deepest wisdom, our deepest joy, is already there, like a long-buried memory, inside us, just waiting to be reawakened. At five years old, up past my bedtime, bathing in the television’s blue glow, Rod Serling’s universe wasn’t alien to me: I recognized it. I was home. So you could say I was born a citizen of The Twilight Zone. For that matter, I was born a citizen of Oz and Neverland, Dickens’s London and The Magic Kingdom. All these stories continue to echo through my consciousness and influence my work, and my life, in strange, miraculous ways I still don’t completely understand. I love the Twilight Zone. I still come across episodes I've never seen before from the original series. I typically gravitate to having a favorite (tv show, movie, whatever) be something that I saw when I was young...but in the case of the Twilight Zone TV series, it happened to be an episode I saw as an adult. Just like you it also starred Burgess Meredith, but my favorite episode is "The Obsolete Man". I can't pinpoint one specific thing I was struck by. It was definitely odd seeing Meredith look so young. Even when he played Bemis, he looked older. He's certainly not young in "Obsolete" but younger than I'm used to seeing him (Rocky/Clash of the Titans). The story was simple, simple sets, simple premise, but man for a 22 minute episode it certainly did seem to convey a powerful, lasting (and still pertinent message). The Twilight Zone creations (be it movie, television, comic books, whatever) that share the title but don't have Rod Serling's stamp on them are never quite the same (ever seen the movie from the early 80s?). Rod was truly a unique talent. One of my all time favorite movies is the original Planet of the Apes, and that iconic ending scene was written by Serling. I watched it with my kids earlier this year, and they had no idea of the ending. Seeing their faces at the big reveal was incredible. It still pays off nearly 50 years later! I wrote an episode of the 80s TWILIGHT ZONE. George, and as good as that show was—it includes the brilliant "Her Pilgrim Soul" by Alan Brennert, one of the best things I've ever seen on TV—it wasn't Serling's ZONE. His vision saturated every frame of every episode and the other major writers of the series—Matheson, Beaumont, Johnson—were all cut from the same cloth. It's a series unique in TV history and there's really no point in reviving it. Another supernaturally themed anthology series? Sure. But don't call it TWILIGHT ZONE. And I know what you mean about watching your kids' faces. I remember when my daughter was around nine or ten and I turned her on to the ZONE. Watching her watch it with those wide, innocent eyes was a thing to behold! You said "Another supernaturally themed anthology series? Sure. But don't call it TWILIGHT ZONE." Like Night Gallery for instance? That was a good show. I've seen the re-runs. Somehow though it seems more dated and less effective than Twilight Zone. Two things I think cause that (1) Color - somehow the black and white of the original adds to the mystique of the show and (2) Fashion - somehow the wardrobe and fashion of the late 60s and early 70s seems more dated than what was worn in the original series. I know that seems backwards, but that's how it comes across when I watch it. That being said, there were some good episodes and some great guest stars on Night Gallery. Another anthology series I enjoyed was "Alfred Hitchcock Presents". Similar to the story of your five year old self seeing Harold Bemis for the first time, there was one episode of Alfred Hitchcock Presents that petrified me as a child "The Glass Eye", the premiere episode of season 3. I remember seeing the re-run on Nick at Night when I was very young, and being so scared afterwards that I couldn't sleep. I've never seen "Her Pilgrim Soul" by Alan Brennert. I'm going to find it and I'll let you know what I think. There's been lots of great anthology shows (Tales from the Dark Side, Ray Bradbury Theatre, Amazing Stories, Tales From the Crypt), but the original Twilight Zone is still the best, after all these years. It's really incredible you got to contribute to the series. You've had an incredible career. If I'm not mistaken, George, "The Glass Eye" starred a very young William Shatner. I totally agree about TZ holding up better than NIGHT GALLERY for those very reasons. Black and white makes the show somehow eternal, not old. And the fashion point is also spot on. And of course the main reason TZ holds up better is that Serling was in control of that series. On NIGHT GALLERY—despite the fact that he wrote some excellent episodes ("They're Tearing Down Tim Riley's Bar" being my favorite), he was not in control of the show's vision and that brought NG down in the end. You won't be surprised to learn that I liked RAY BRADBURY THEATER, especially the earliest episodes on HBO. William Shatner (him again?) was in my favorite, "The Playground." But you're right again: No one has come close to topping the original TWILIGHT ZONE. I think "Her Pilgrim Soul" is out there on the web. Please watch it if you can. It's beautiful. You're right. Shatner was in "The Glass Eye". I had no recollection of that at all. I just looked it up. He's not the main character, and not in the part that scared me, so I didn't realize it was him. You have a great memory for this stuff. It's amazing! I did track down "Her Pilgrim Soul". I watched it. I didn't like it as much as you did. It's a bit too sad for me. That's what I get for being a Shatnerd. Sorry you didn't enjoy "Pilgrim Soul," but, hey, that's what makes horse racing! The older I get (and I'm still pretty young comparatively) the more I love anthologies across mediums. Weird War tales, Shock Suspenstories, Tales from the crypt (comic and show), the outer limits (both series), Creepy (70s of course), EERIE (see previous), Tales from the Darkside, Twilight zone '85, twilight zone '02, Mystery in Space, Night Gallery, and many, many more. Also Weird War Tales. But of course, the Twilight Zone. One of my favorite TV shows since the 3rd grade. IN fact I would say the Twilight Zone and The Simpsons (sadly it does have a point is spudders out, bu my date is later than many people) are the two best television shows ever. I would never want to take away from the issues and seasons long storytelling that now infects our culture, you know juggling like that is a talent, but making you care and go for a full ride in an episode? 22 pages? 8 pages/ That is some serious skills as a writer. Interestingly, I always thought PKD's short fiction was better than his novels. It is almost like a an dying art-form. And by God, Serling was a master of it. That link may not do much, but it is something. Its funny, Science fiction form the 50s and early 60s seem so timeless, even when you are smacked in the face with elements, but sci-fi now, feel like... sci fi of now. But back to Serling. The Twilight ZOne will stand as his greatest work for a very good reason. It is exactly what a creator's work should be, it gives you a look into the author's view on the world is, but not in a way that is oppressive to the reader. Not a lecture or a forced viewpoint, a stroll through a mindscape you are welcome to join in or not. 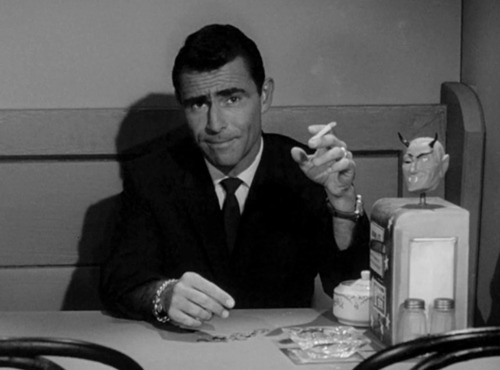 And it didn't hurt that Serling was a man who both saw the world more AND less clearly than most. It is a classic for a reason. It sure is, Jack! If you don't own it, I'd recommend Marc Zicree's TWILIGHT ZONE COMPANION. It was written in the 80s, which means most of the folks involved with the show were still alive and interviewable (if that's a word). There are several other great TZ books out there, but COMPANION remains the best. I'm waiting for someone to do a deep, lengthy biography of Serling. There have been a couple. Enjoyable, but they've been on the short side. I think Rod is deserving of deep dive: a masterful bio by a masterful writer. Th magazine I linked to, was full of things I knew already (and a few I didn't), but the way it was set up was great. It really clarified that the show was born in the Pacific theater. From his best friend being crushed by supplies(Rod himself giving the funeral service), to almost being killed by a Japanese soldier, to a youthful love of science fiction, to well... you should read teh article. Point is, that is where it all comes from. Serling I believe had some form of PTSD, albeit an atypical one. A few years a go a book, (and a second book) came out with"twilight zone" stories, edited by his wife. I only have the second, but it was pretty good, and contains a short story by Serling. Oddly, for all the Twilight Zone comics, I have always been surprised that Night Gallery never got a four color version. It seems made for it. I will also recommend "Twilight Zone: 1959" by Dynamite. Straczynski's mini series was really good, but not the Twilight Zone... more its own thing. But the annuals and one shots tended to be closer, but 1959 had a t least one story that REALLY hit the mark. Its too bad that there are no comic creators attached with this website, with decades of experience and a professed love of the show that could contact Dynamite about doing a Twilight ZOne comic while they sill have the rights. Too bad. I've read about those war years a number of times and, yes, those experiences certainly shaped him. And I wouldn't be surprised if, as you say, he had some form of PTSD. I think his writing provided his therapy. If only getting gigs in comics were as easy as you imagine! Doesn't always work this way. And, finally: Serling's daughter Anne wrote a lovely memoir called AS I KNEW HIM that came out last year. Highly recommended for the Serling fan. Oh, I'm aware of how difficult it is. IN fact, I have recently been looking at just how much can go wrong in a comic book's working to their best possible potential. I tend to shy away from biographies by family members. It is less a look at a person, than an individual's view on a person... which can admittedly be interesting in and of itself. It is just a question of how accurate it is. If you want somethi9ng interesting on THAT, I would recommend looking into General Sherman's life after the Civil War. Sherman was famously the man responsible for "Sherman's march to the sea," the controvertial act of 'total war' depicted in "Gone With the Wind." Point is, he had a great relationship with those who served beneath him. They even referred to him as "Uncle Billy." In the aftermath of the war many veterans had issues more attributed to the Vietnam War (homelessness,trouble holding a job, violent dreams, flashbacks, etc.). Sherman would often let them stay with him for a time, feed them, and give them jobs to do in order to earn some money.... and that was when he didn't just give it those too shell shocked. It was about 100 years before ANY research was done, but his journals and notes are considered some of the earliest accounts. It actually has also been used to lend credence to the idea that Vietnam PTSD was more common and violent than say WWII, because of the method transportation. In other words, boats move slower than planes, so there is more time to talk things put, and it separates you more from the war. Of course, I'm know psychologist, so I can't weigh in on that theory.